Discussion in 'DPF Game Room' started by dancecats, Aug 19, 2012. OOC: We are at 'that point' in the murder game, that's for sure. 'That point' being where most players most likely have at least a short list (with a probable top candidate) of who they think the killer is. The question is, who will get the nerve to make the (correct) guess first ... ? I'm actually expecting to start getting guesses/arrests starting around any time. I'm curious to see who everyone else may suspect. I have 2 or 3 suspects in mind, but nothing concrete at all to make me confident enough to guess. Belle enters the Beach Club and studies the latest murder scene with the others. She does not mind that Dug had been sticking with her after the restaurant and only hopes the pup is doing better after the horror of what happened to his friend. And, the more the detectives stick together, certainly all the better. "Oh boy, I wonder what has happened now. Why is the minnie mouse lady missing and who killed the fox. I did not like the fox but he was part of our detecting pack. I want to find this bad person thing that is killing all of our detecting pack and bite him/her very good." Dug's communicator speaks his thoughts and Belle nods, "The fox may not have been trustworthy, but he was certainly harmless and seemed as though he was helping us." Dug went off to sniff around the room for clues and Belle's thoughts were interrupted by Hook shouting Ouch! "BLAST it ALL, a SPLINTER! ", Hook cries. Belle walked over to him, "Here, I think I can help." "Thank you," Hook said graciously after she helped him remove it. He then hands the wood to Tinker Bell and investigates it with her. She tries to think of what it may be a part of as well when Kuzco speaks up. Belle looks over at the now open door to the room. "Maybe she got a call from Philip?" she said, almost hopefully. She hoped Aurora had just stepped out briefly. Hook turns to see that Aurora is gone. "Blast, if we lose another princess the studios are going to have to start cranking out films faster to keep up with the losses!" "What the devil is going on out there!? ", asks Hook. "Blast if I understand a DAMN thing you say, but we're not losing another one- I'm going after her to do my best to assist her." With that- Hook runs out the door and toward the shadowy figure yelling, "FORWARD!!!!!" To Himself:::"COME ON!!! Can't I just have one thing go my way? I would like one evening...just ONE!! I mean I am supposed to be relaxing....recovering....Well I guess I better go down and see if Ursula is ok and if we can sneak away." With the commotion of another dead body in the room, it seems someone has taken this time to adjust the color of the lake outside, to a glowing green? And on top of that, another detective has vanished, well, had vanished. Aurora is seen walking towards the water, but for what reason? Kuzco yells out to stop her, he doesnt want to lose another detective, or is it because he doesnt want to hear the grief from her price? In either case, Hook darts out the door down the hallway to start taking off after her. Stitch not wanting to waste anytime, just jumps right out of the window and climbs down the side of the building and meets hook just as he emerges from the front door heading towards the lake. --Suddenly things start happening too fast.Stitch is climbing out the window and Hook is pushing out the door. Doofenshmirtz is determined to be a hero just once in his life. Dr. Doofenshmirtz runs out the door and hits Stitch on the head with his flashlight. This distracts Stitch just enough for him to pull ahead. He then shines the light in Hook's face. "TICK TOCK >>>TICK TOCK...I think I see a Croc." --Heinz turns towards where Aurora is continue to walk towards the water's edge as if in a trance. "Princess Pinky...Princess Pinky!!!! Wait for me." Aurora continues walking not hearing him at all. Before he can reach her she is already waist deep and not stopping. Not knowing what else to do Doofenshmirtz gets in front of her and grabs Aurora by the shoulders. He gently shakes her and yells...."Come on princess.....SNAP OUT OF IT!!" Yelling and shaking doesn't work either. 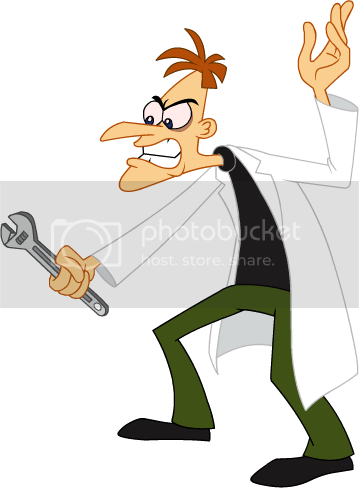 Finally Doofenshmirtz does the last thing he can think of. He gives princess Aurora a big wet kiss on the lips. To himself...."Oooih....Yuck...and some people say my relationship with Ursula is strange." "What were you thinking princess? ...but though she is out of her trance Aurora has no answer for the scientist. Doofenshmirtz turns Aurora around and leads her gingerly out of the water. The others are just reaching the water's edge...except for Hook who still seems to be reluctant to get to close to the water. Doofenshmirtz has a big smile on his face...not only from the kiss, but for the first time others are looking at him in a heroic manner. OOC: Howling with laughter right now. :rofl: Thank goodness I'm in my room, alone, and not ... oh, I don't know ... in the presence of other people. They'd think I'd lost my mind - and they might be right. Tink flies out over the lake in front of aurora tink tries everything to stop her, even pulling her hair until dr doof gently pushes her out of the way and planks a wet one on the princess, Tink looking on in shocked horror is glad to see the princess come out of her trance but is sickened by the kiss! Merlin sees the commotion and looks out to the lake. "Oh, green glowing water . . .I should get a sample for research! Who knows what fun reactions it might have with the right chemicals." Merlin, noting Aurora has been safely returned to her senses, starts walking toward a quiet spot of the lake near some trees. "I'll be right back guys, I simply must get a sample of that glow! Think of the scientific benefits! And the experiments I could perform." Merlin starts laughing slightly at the thoughts of experiments to come as he digs out a flask for water collection. Diablo flies out the window when Kuzco points out the blonde girl walking in a seeming trance out to the lake. Oh no, not again! What is it with that girl and trances, really now! He follows Tink and tries to help wake up the blonde girl, circling and cawing loudly, even knowing it will be no use... When suddenly the white-coated man plants a huge wet kiss on the blonde girl! Disblo nearly tumbles out of the air with laughter. Well, he thinks, the man does seem to have done his homework when it comes to enchanted sleep! The dawn-girl blinks and comes out of the trance, and lets the Doof man lead her back to shore. Diablo flies back to Stitch to see if he is alright. Merlin leans down to collect a sample, humming to himself, just in time to avoid a green bolt aimed for his head. "GADZOOKS! WHAT . . ? WHO . . ?" Merlin notices the bolt fired from the direction of the trees behind him. "Why didn't you warn me?!" he scolds the carpet bag at his heels. "I KNOW YOU'RE IN THERE! I WON'T STAND FOR THIS!" Merlin pulls out his wand, and roll up his sleeves as he angrily storms towards the dark tree line. He doesn't know what to expect, but he hasn't been this angry since he battled Madam Mim. Merlin fires a blue bolt of magic into the trees blindly, hoping to draw a reaction. "I am no novice, you had better be good if you want a piece of this old wizard." The other detectives hear Merlin yelling and look over just in time to see a cascade of Blue and Green sparks firing in different directions from the trees. The duel gets so intense that guests in the closer parks stop to watch this new fireworks display, never fully knowing where it came from. Yelling and struggling can be heard from different parts of the trees as Merlin continues to battle this unseen force. "Ouch, that hurt! HA MISSED ME! Where did these thorns come from? Show yourself, you can't escape. I have you surrounded . . . on this side." *upon reaching the beach, Ursula just shakes her head as she witnesses what is probably one of the most horrible events to ever occur in history. The blackmailer in her went and snapped a few pictures anyway. She then forwarded them to prince philips inbox. Off to the side she noticed Merlin in a heated battle with an unknown assailant. Just as Stitch had made it to the base of the hotel, he is whacked on the head with a wrench from Dr.Doof! It isn't enough to know him out, but it is enough to disorient him to the point where Doof is able to make it up to the princess, who was already in the water. Stitch guesses it was a good thing Doof stopped him, since Stitch isn't a big fan of swimming. But at the same time as Stitch being thankful for not having to go into the water, he isnt too thankful for having to watch the doctors kiss, which was probably his first and last. Merlin's carpet bag, fearing for it's master's life 'runs' to get help. Seeing Kuzco, it begins frantically trying to get his attention. As more sparks shoot off, the bag begins acting like an angry dog. It grabs the leg of Kuzco's robe and begins pulling him toward the trees. "Get off of that robe, it's expensive . . . and you frighten me slightly." Kuzco kicks the bag off, and it tumbles down a bit. The sugar bowl has had enough of being ignored, and jumps out of the bag. "It's time I take matters into my own handles," it thinks to itself, as it lacks a mouth to speak. It quickly hops over to Kuzco and begins hitting him with his spoon. Kuzco looks down and sees the angry sugar bowl, how can a sugar bowl seem angry he would later think to himself. It is hopping and gesturing towards the bag, which is bounding like an excited puppy waiting for people to follow. Dug had followed the others out to the green lkake. He knew it was glowy but he is colorblind so he trusts them hen they say itsgreen.... Suddenly he sees his mast Merlin running to the trees shouting. firwork like sparks and bangs begin erupting from the area. Dug goes into doggy overdrive and dashes for the trees, his low slung body easily weaving around and away from the random booms sparks and thorny branches that suddenly appear. Arriving at his "masters" side, he growls loudly, nose scenting the air for the enemy. "where is the bad person master? I will bite a leg and stop them from hurting any more of our friends. I cannot scent them with all this magic in the air. It is clogging my nose! Please tell me where to go master Merlin!" Belle runs out to the water with the others after seeing Aurora move towards Crescent lake, everything tainted with an eery green glow. She brushes off any and all terseness received from Kuzco at this point as she realized, notwithstanding the annoying quirks, Kuzco was just as committed to ending this murder spree as everyone else and just as exhausted as everyone too. Rushing down with the others, Belle stops dead in her tracks after seeing that Hook was temporary spooked by the water (probably connected to the crocodile phobia). What spooked her, however, was the scene of seeing the scientist kiss Aurora. Belle feels a flicker of indignation at the task and then looks at the chaos surrounding the beach and sighs. She walks over to get the towels. Ooc....Stef I have to ask because it effects my next post...is this leading to an arrest as it seems it might be? Diablo flutters around Stitch, clicking sympathetically; his friend seems to be alright, if a bit dazed. Just then he sees the green and blue fireworks start. What is going on?